Not a drop of blood is spilled in Peter Strickland’s Berberian Sound Studio. Even so, Italian-horror buffs may feel a flush of nostalgia watching this bewitching genre whatsit, which manages to evoke the crimson-splashed shockers of the 1970s without so much as a single frame of actual carnage. The film is set during the post-production of a fictional, third-tier exploitation flick, the kind of revenge-of-the-witch potboiler Lucio Fulci could have knocked out during his prolific heyday. This movie-within-the-movie is never glimpsed, but it is heard: While no-name actresses screech unconvincingly and coo eerie lullabies, a frazzled British soundman provides the sonic evidence of unseen atrocities, from the splatter of a body on pavement to the sickening sizzle of a red-hot poker being used in a way its maker certainly never intended. If nothing else, Berberian Sound Studio demonstrates how much modern horror cinema owes its success to microphones and vegetables. 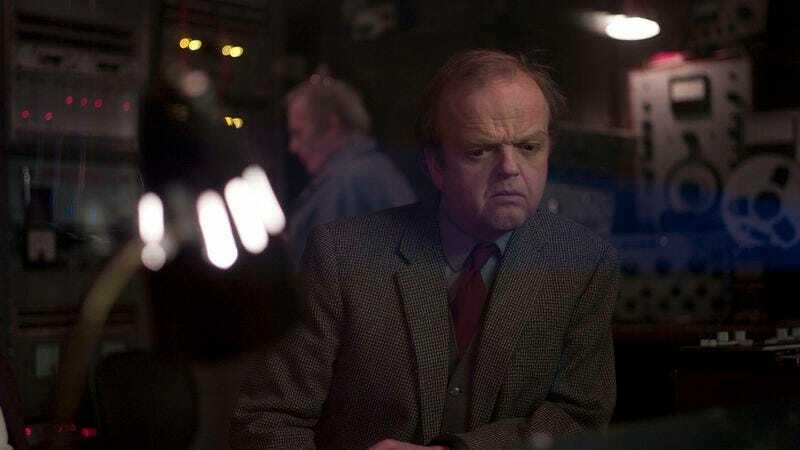 Said soundman is played by Toby Jones, that squat, distinctive character actor, disappearing into the role of a meek professional struggling to keep hold of his dignity and his sanity. Jones, who’s so violence-adverse he won’t squash a spider, is dismayed to discover that the Italian film he’s been misled into working on is pure sadistic schlock. (When he mentions the “equestrian” angle that was used to rope him in, Cosimo Fusco’s condescending producer replies: “Oh yeah, a horse-riding girl. She’s just not horse riding anymore.”) There’s an element of fish-out-of-water comedy here, as the out-of-place Brit copes with a steady stream of slights, including the filmmakers’ attempts to stiff him out of airfare. Antonio Mancino’s director, a horndog hack with pretensions of artistic seriousness, spends more time on the casting couch than in the studio. Fusco lobs insults at everyone in sight. A bored secretary (Tonia Sotiropoulou) skirts her duties. None of them demonstrate an iota of respect for the gifted craftsman they’ve brought in to class up their bottom-feeding genre exercise. Slowly but surely, cinema and reality begin to blur for Jones, and Strickland—an up-and-comer with a flair for slow burns—traces his descent into madness. As a psychological thriller, Berberian Sound Studio is often hypnotic, but it’s also a little one-note: About halfway through its slim running time, the film begins to repeat itself, offering only minor variations on its Blow Out-meets-Suspiria metholodogy. The whole thing works better, perhaps, as a procedural tribute to the art of audio engineering. Strickland zooms in close on dials and knobs, displaying a fetishistic appreciation for the tools of the trade. He also honors the nuances of Foley work and ADR, making a case for mixing-board magicians, watermelon smashers, and vocal virtuosos as the true unsung heroes of moviemaking. At its core, this is a film about cinema’s ability to rewire the brain—an organ best accessed, Strickland argues, through the ear canals.